I was watching a cat, calico and sunning herself on the metal roof of our shed, when the weather suddenly shifted. One moment the light was grazing contentedly upon the emptied winter landscape and the next, the whole earth had clouded over with snow. 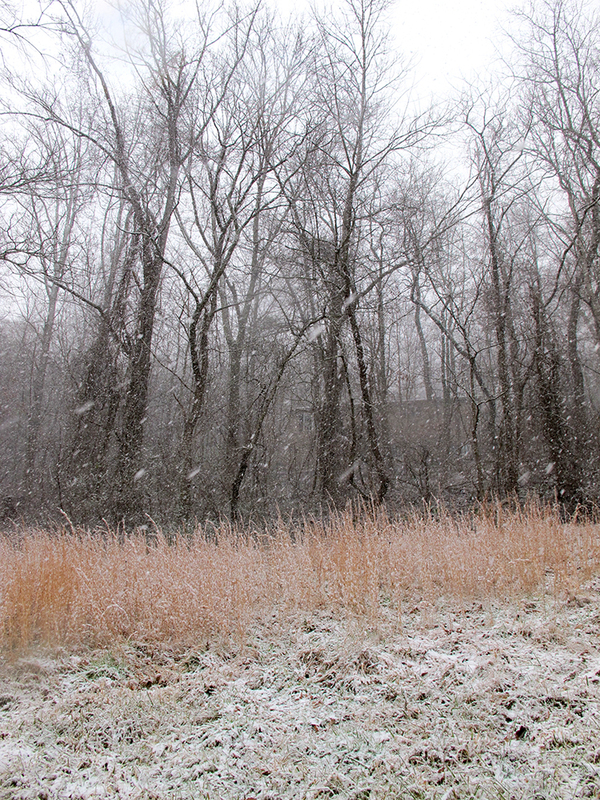 Moody and feline, more than falling, the thick flurries raced toward the ground. It was a complete surprise. We’ve been dogsitting for a large, ruggedly handsome German shepherd this week. With the furious arrival of so many flurries, I ran to the back door to rescue the poor dog amidst the storm. Poised like a sphinx on our back stone steps, letting the whirl of the unexpected blizzard lick at his fur, he was decidedly nonplussed. He looked at me, cold flakes scattered like pearls across his paws, and my plans for hot tea and cozying in bed quickly dissolved. 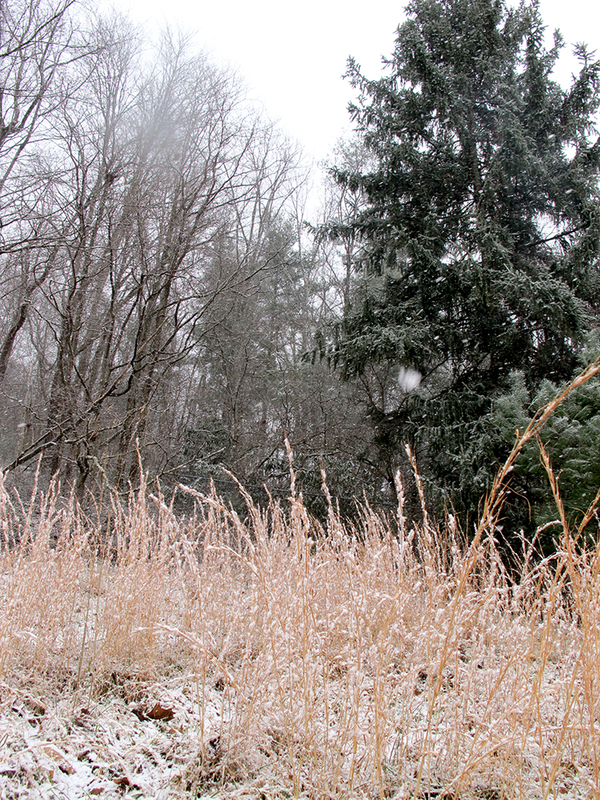 I threw on my coat, slung my camera around my neck and launched myself out into the snow. The sky nuzzled my face; the wind pushed my coat open with its insistent snout. The sun hid, and I didn’t miss its light. 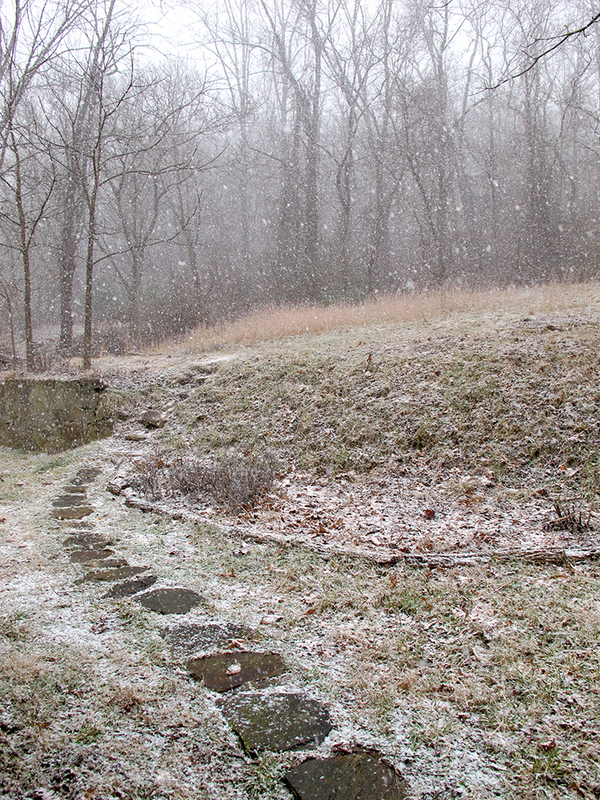 I explored the small slope of my backyard and caught the tiniest flakes. The mountain itself was obscured, forgotten. There was no need for grand vision, because it was all happening now. In that moment, I let go of all the biggest things. I released the overarching resolutions of transformation, the great callings for initiation, the howling insistence of change. Talent the dog bounded in loops through the high winter’s yellow grass. I ran after him. We both chased the tiny unseen patterns of the storm. We spend so much time trying to approach the vastness of the world. In the seemingly endless array of diversity and opportunity, I am often overwhelmed. There are always new arcs of possibility snagging my attention, great shifts with unheeded arrivals, universal callings that tug at me like bramble to the hem of my sturdy winter coat. But the reality is that the world, my world, can also be gloriously small. There is revelation in each precious detail: the dark hedge of queen anne’s lace defining the collar of the hill, the dense cloud of snow forming shapes in a miniature space of sky, forgotten stones gathered like tiny, well-worn villages in the swirl. I make this pilgrimage through my life, not only to encounter the wide world I inhabit, but to touch the smallest worlds that inhabit me. What is inside each moment is so incredibly brief and varied. It takes courage to stop and simply appreciate the perfectly rounded circle of what exists within your reach. Today, the world was a snow globe, shook— and I gave myself permission to spend a long moment witnessing it settle. Oh I love that! Thanks for sharing Rick. Serendipities like that make my world go round. Unbelievably beautiful. I am so glad I discovered your blog. Thank you. Thank you very much for your kind words Tasha! I’m honored. The “perfectly rounded circle of what exists with in my reach”….I love that concept, I feel the centeredness smallness of it. It brings peace, and is the other face of the peace that comes from the feeling of being a part of the fabric of all that exists and has ever existed. What beautiful imagery Asia. I felt right there with you and Talent. I will never think of wind quite the same again, with its insistent snout. Brilliant! Thanks for sharing your perennial sweetness and vision Sylvia! The world seen through your eyes (even when sad and strange) is always a beauty and a revelation to me. I am sending many prayers for cloudy skies, clear rain and swollen creeks your way.